The football team won the Ivy trophy, and records fell. Quarterback Collier Winters dove for Harvard’s third touchdown in a 37-20 defeat of Penn. Later, Winters watched from the sideline as the defense scored a bonus touchdown on an interception return. The Penn victory clinched an Ivy championship for the Crimson. With a 32-yard interception return in the fourth quarter, captain and linebacker Alex Gedeon scored Harvard’s final touchdown of The Game. In their wisdom, the football gods decreed that the quest for the 2011 Ivy League football championship should not go down to the wire. A week before the season ended, Harvard eliminated its last remaining rival for the Ivy title by drubbing Pennsylvania, 37-20, at the Stadium. Brown, the only other contender, had just lost to Dartmouth. With two league losses apiece, Penn and Brown were out of contention. For Harvard, still unbeaten in Ivy play, the championship was guaranteed. Harvard teams had previously won or shared 13 Ivy trophies, but none had clinched an outright title before the last weekend of the season. That feat was topped off by a 45-7 blowout at Yale Bowl, Harvard’s tenth victory in the last 11 meetings with the Blue. The team was a powerhouse, averaging 37 points per game and establishing a Harvard scoring record of 374 points for the season. The modern record of 339 points had been set by the undefeated 2004 team. Like that one—once described by the Boston Globe’s John Powers ’70 as “an all-terrain, all-weather scoring machine”—the 2011 team could score points whatever the conditions. Harvard beat Brown in a drenching rainstorm, and routed Dartmouth in a blizzard. With a fast-paced no-huddle offense that featured a two-tight-end set, the Crimson bedeviled opposing defenses. Resilient indeed. When three offensive linemen were lost before the season, untested underclassmen—including a freshman tackle—stepped up. By midseason, the O-line was widely regarded as the Ivy League’s best. Though opposing teams scored first in five of the last seven games, the Crimson offense was quick to strike back. When veteran quarterback Collier Winters missed four games with an injury, Harvard partisans were relieved to find that their team had another talented passer in reserve. Winters pulled a hamstring muscle when he ran for a two-point conversion late in the opening game, a 30-22 loss at Holy Cross. Colton Chapple, a junior from Alpharetta, Georgia, got the starting assignment against Brown a week later. A third-stringer when the 2010 season began, Chapple had started three games, but had completed just 30 percent of his passes. His work on a rain-soaked night at the Stadium showed great improvement. He ran the offense with assurance, and in the final quarter, with rain falling in sheets, he unloaded a 56-yard touchdown pass to receiver Adam Chrissis ’12, giving Harvard a decisive 14-point lead in a 24-7 win over one of the Ivy League’s strongest teams. Chapple played for only two periods in a 31-3 walkaway at Lafayette the following weekend. He’d connected on 14 of 18 passes for 121 yards and a touchdown when a hard hit put him out of the game with back tightness. He was mobile enough a week later to enjoy a career day at Cornell’s Schoellkopf Field, where Harvard outscored the Big Red, 41-31. The two teams struggled mightily for three periods, with the lead changing hands five times, but Harvard finally pulled away, scoring 21 points in a seven-minute stretch. Chapple completed 23 of 38 pass attempts for 414 yards—the second-highest single-game yardage in Crimson annals—and four touchdowns. Back at the Stadium, he outdid himself in a 42-3 rout of Bucknell. He threw five scoring passes, matching a 58-year-old Harvard record set by Carroll Lowenstein ’52 (’54), and becoming the first Harvard passer to throw for four touchdowns or more in consecutive games. All five scoring passes came in the game’s first 35 minutes. Chapple watched most of the second half from the bench while the reserves mopped up. Chapple had now thrown for a league-leading 12 touchdowns, and had the Ivies’ top passing-efficiency rating. But when Princeton came to the Stadium, it was Winters who started at quarterback. None the worse for his four-week layoff, he put on a spectacular show, completing 34 of 42 passes for 403 yards and, yes, five touchdowns, adding another touchdown on foot. Harvard needed all the offense it could muster that day. Ahead 42-16 in the third quarter, the team had to fight off a furious Tiger rally that cut the lead to three points in a 10-minute span. But two late-game touchdowns gave Harvard a 56-39 victory, its fourteenth in the last 16 meetings with Princeton. After record passing displays in a three-game stretch, the Crimson unlimbered its rushing attack in a snowy night game against Dartmouth. As a late-October storm blanketed the Stadium turf, three backs ran for more than a hundred yards each in a 41-10 wipeout. Tailback Treavor Scales ’13 rushed for a season-best 139 yards. His alternate, freshman Zach Boden, ran for 117, while quarterback Winters scrambled for a career-high 126 yards. Each back scored two touchdowns. Not since 1890 had a Crimson team reached the 40-point level in four consecutive matches. Harvard was now the only Ivy team without a league loss, a game ahead of Brown, Penn, and Yale in the standings. Brown had dealt Penn its first league defeat, 6-0, on that snow-swept weekend, ending an 18-game Ivy winning streak. Penn had beaten Yale a week earlier. At Manhattan’s Wien Stadium the next weekend, a hard-charging Columbia defense sacked Winters five times, but the versatile quarterback had another outstanding day in a 35-21 defeat of a winless but spirited Lion squad. He completed 20 of 30 passes for 323 yards and three touchdowns, scoring another touchdown afoot. Next came Penn, the defending Ivy champion for two seasons running. The Quakers and the Crimson had jousted for Ivy supremacy for the past decade, and had split, 5-5, in their last 10 meetings. Penn had won handily in the last two contests, knocking Harvard out of title contention. But now it was Harvard’s turn. Penn took a 7-0 lead late in the first quarter, but the Crimson defense got a game-changing takeaway on the Quakers’ next series, when tackle Josue Ortiz ’11 (’12) forced a fumble and recovered the ball at the Penn 24-yard line. On Harvard’s first play from scrimmage, Winters found tight end Cameron Brate ’14 on a crossing route in the end zone. That started a run of 37 consecutive points that put Harvard in front, 37-7, midway through the final period. The points came on a 14-yard run by Zach Boden, a 35-yard field goal by David Mothander ’14, a four-yard run by Winters, a two-yard run by Treavor Scales, and—just 20 seconds later—a 34-yard interception return by linebacker Alexander Norman ’13. After Penn’s early scoring drive, Harvard’s defense kept the Quakers out of Crimson territory until late in the game, when Penn took advantage of two fumbles to score twice in the final minutes of play. Ortiz led the Crimson defenders with 10 tackles, two quarterback sacks, and his pivotal fumble recovery. The Quaker running attack was held to 24 yards rushing. With the ivy title in hand, Harvard traveled to Yale Bowl to put a finishing touch on an epic season. After a Yale scoring drive in the opening period, a shape-shifting Crimson defense kept the Blue in check for the rest of the game, breaking Yale drives with a forced fumble, a blocked field-goal try, and three interceptions. Yale was outplayed on both sides of the ball. Harvard got three first-half touchdowns and struck for three more in the final quarter. The first-half scores came on a four-yard dive by Winters; a 20-yard pass from Winters to senior receiver Alex Sarkisian; a fake field goal that had the kicker, David Mothander, slanting into the end zone from seven yards out; and an authentic 21-yard field goal by Mothander as time expired in the half. After a scoreless third period, Harvard erupted again with an 11-yard rushing touchdown by Zach Boden, a swing pass from Winters to tight end Kyle Jusczcyk ’13 that Jusczcyk turned into a 60-yard touchdown, and a 32-yard interception return by linebacker and captain Alex Gedeon. Harvard’s 45-7 victory was the most lopsided in the Harvard-Yale series since 1982, when the Crimson won at the Stadium by the same score. The Yale game was the valedictory appearance for Collier Winters. The fifth-year senior from Claremore, Oklahoma, completed 27 of 42 passes for 355 yards and two touchdowns, and was also the game’s leading rusher, picking up 62 yards on 11 carries. Though injuries forced him to sit out the equivalent of two seasons, Winters finished his Harvard career with 4,347 passing yards and 33 passing touchdowns. He was at his best against Yale. 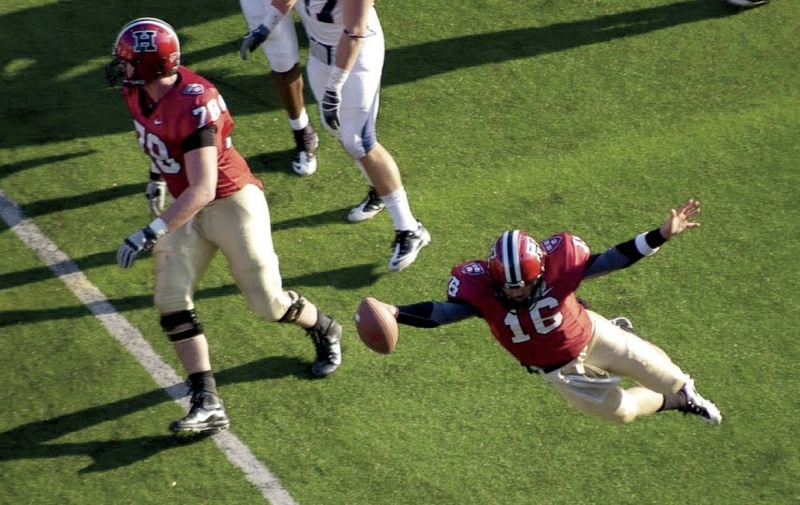 In the 2009 game he threw two long touchdown passes that gave Harvard a 14-10 victory in the final minutes of play, and in 2010 he passed for what proved to be the game-winning touchdown in a 28-24 win. Tidbits: Since the start of formal Ivy League play in 1956, Harvard leads Yale, 31-24-1, and hasn’t lost at Yale Bowl since 1999.…With a won-lost record of 120-59 in 18 seasons at Harvard, Tim Murphy now has the most wins of any Crimson coach. The former record of 117 was set by his predecessor, Joe Restic , who coached from 1971 to 1993. Pass masters: Quarterbacks Winters, Chapple, and Michael Pruneau ’14 combined for 26 touchdown passes, a Harvard record. The previous high of 21 was set in 2003. Winters had 13 scoring passes, Chapple 12, and Pruneau one.…With 403 passing yards against Princeton, Winters became the third Harvard quarterback to break the 400 mark. 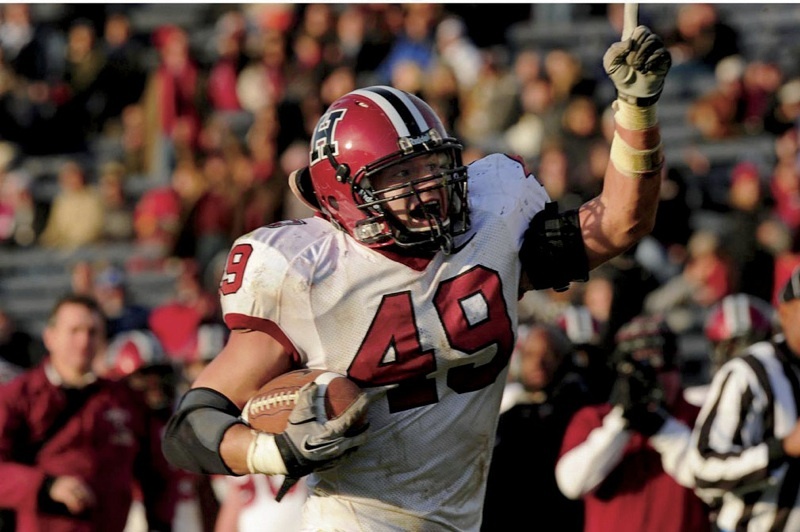 The first was Neil Rose ’03, who passed for 412 yards at Brown in 2000 and for 443 at Dartmouth in 2002. Just two weeks earlier in the season, Chapple had thrown for 414 in the Cornell game.…Winters’s single-season completion rate of .686 set another Harvard record, and his career percentage of .617 is second only to Rose’s .624. Prime targets: Kyle Jusczcyk and Cam Brate were the prongs of Harvard’s two-tight-end attack. Jusczcyk caught 37 passes for 512 yards and seven touchdowns, while Brate caught 25 for 386 yards and seven touchdowns. The top wide receivers were seniors Chris Lorditch (35-545-2), Alex Sarkisian (33-435-6), and Adam Chrissis (16-201-2). Triple threat: Seitu Smith III, a fleet freshman from Florida, led the Ivy League and set a new Harvard record with a kickoff-return average of 29.9 yards per game. A 91-yard runback in the Bucknell game made him the first Crimson freshman to return a kickoff for a touchdown. Smith also saw spot duty as a receiver and running back. In the Princeton game he picked up 220 all-purpose yards: 122 on five kickoff returns, 54 on six pass receptions, 42 on a punt return, and two rushing. Fresh talent: Smith was one of four first-year players who made their presence felt throughout the season. Zach Boden, alternating at tailback, was Harvard’s second-leading rusher, carrying 79 times for 484 yards and six touchdowns. Will Whitman, a six-foot-six, 280-pound tackle who was onfield for every snap, was the first freshman offensive lineman to win a starting assignment in coach Murphy’s 18 seasons at Harvard. 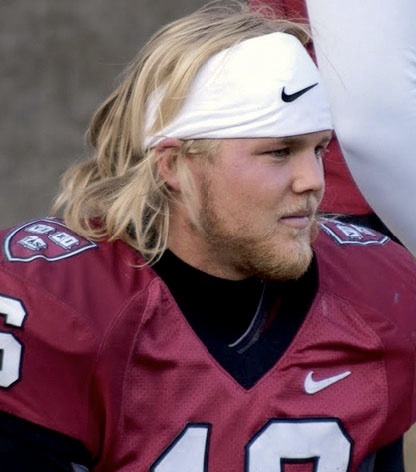 Zach Hodges, an alternate at defensive end and a regular on the kickoff team, was credited with 20 tackles, two quarterback sacks, and a forced fumble. Hard to budge: With fifth-year senior Josue Ortiz and juniors John Lyon, Nnamdi Obukwelu, and Grant Sickle as the starting front four, Harvard had the Ivies’ top rushing defense, allowing an average of 89.7 yards per game. 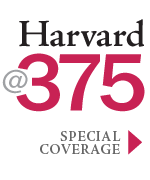 Upper reaches: The 95 combined points in the 56-39 Princeton game were the most in any Harvard game since 1891, when the Crimson subdued Wesleyan, 124-0. Dark and stormy: Home openers have been played at night since 2007, when a $5-million rehab lit up the Stadium, but not until 2011 had Harvard played two home games under lights. Despite drenching rain, the Brown opener drew an announced attendance of 18,565. Some 6,000 loyalists braved a late-October snowstorm to watch the Dartmouth game.…Harvard’s record in Stadium night games now stands at 6-0. Postseason honors: Tackle Josue Ortiz received the Crocker Award as the team’s most valuable player, and was a unanimous choice for the all-Ivy first team (see “How to Wreak Havoc,”  September-October, page 106). Captain and linebacker Alex Gedeon and senior cornerback Matt Hanson were also named to the defensive first team, while senior tackle Kevin Murphy and junior tight end Kyle Juszczyk made the offensive first team. Ortiz led the league in quarterback sacks, with 10; Gedeon ranked second in tackles, with 92; and Hanson led in pass breakups, with 10. Twelve other team members received second-team or honorable-mention citations…Bobby Schneider, of Grapevine, Texas, and Dunster House, will captain the 2012 squad. An economics concentrator, he was one of the team’s top five tacklers. Lucky sevens: Harvard has now won seven outright Ivy championships and has shared the title seven times. The last outright championship came in 2007, when the Crimson finished 10-0. Harvard and Brown shared the Ivy title the following year.…Crimson teams have posted at least seven wins in each of the past 11 seasons, an Ivy record. Westward ho: The 2012 season will commence with a Stadium game against a new opponent, the University of San Diego. A return engagement in San Diego is scheduled for 2013. The Toreros (9-2 last season) have faced only one Ivy team in the past, drawing with Yale, 2-2, in an intermittent series from 1999 to 2006.